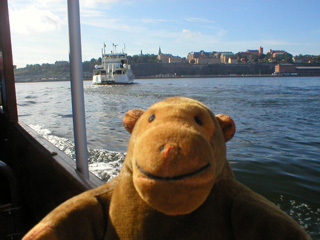 "That ferry is big and red if you get close enough to it"
Mr Monkey was pleased to see that even though there are lots of ferries and boats crossing the waters of Stockholm harbour, they seem to be able to avoid each other. 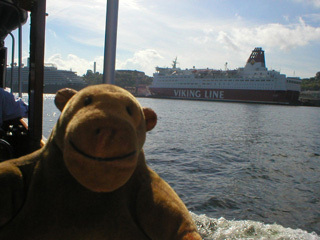 He watched one of the Djurgåden ferries waiting for Mr Monkey's boat to move and let it land at Gröna Lunds, then wondered where the Viking Line ferry, M/S Mariella was going to go when it set off from the Viking terminal on Södermalm. Helsinki or Mariehamn, he decided. You can read about the ferry line at the Viking Line website.